Today 31-Shrawan-2074 (15-August-2017), Government of Nepal, Teacher Service Commission (TSC) publishes a notice and postponed the examination for the written examination between temporary teachers citing recent flooding and its havoc. The examination was supposed to held on 3rd of Bhadra, 2074 (19th August 2017). According to the notice, the examination will be held on 10 Bhadra, 2074 (26 August 2017) from 11 am onwards on the same examination center published earlier. Also See Exam Centers for Temporary Teachers Written Examination Of Open Competition 2074 which was published on 22nd Shrawan 2074 (6th August 2017). 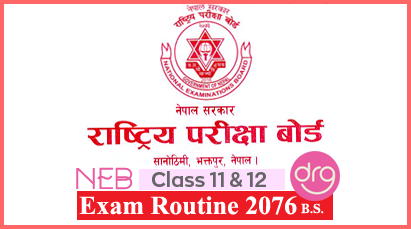 Check and Download in PDF the Exam Centers for 'Temporary Teachers Written Examination Of Open Competition 2074'. 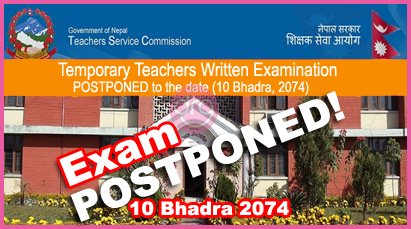 0 Response to "Temporary Teachers Written Examination Of Open Competition 2074 - Postponed | TSC"